A manhunt is on for one or more armed assailants after several rounds of gunfire tore through Parliament Hill, as well as National War Memorial in Ottawa, Canada. The city of Ottawa is on lockdown as police try to locate culprits. "Incidents occurred at National War Memorial, near the Rideau Centre and Parliament Hill this morning," Ottawa Police said on their Twitter feed. Later police retracted their statement about a third shooting incident near the Rideau Centre shopping mall.The shootings began just before 10am on Wednesday when a soldier was wounded in the war memorial shooting. One CAF solider has been killed, reported Conservative MP John Williamson. He was a reservist serving in Hamilton from the Argyll and Sutherland Highlanders of Canada, reported the Canadian Broadcasting Corporation. Government Caucus received confirmation shortly ago that one CAF soldier was killed. A moment of silence followed. 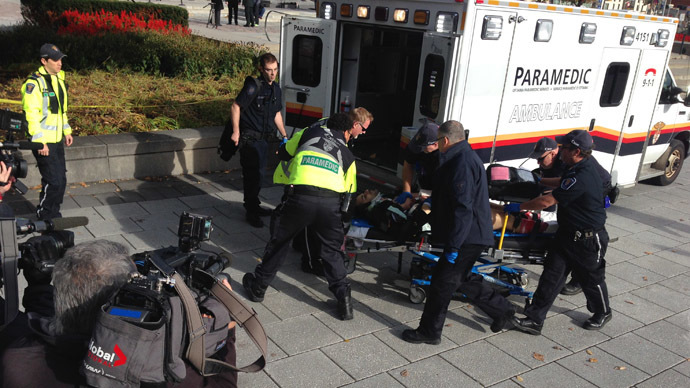 Several shots rang through Parliament Hill, prompting concern over the ease with which the gunman apparently accessed the site. Parliament Hill is never going to be the same. "PM was addressing caucus, then a huge boom, followed by rat-a-tat shots. We all scattered. It was clearly right outside our caucus door," Treasury Board Minister Tony Clement told Reuters. Wingrove also reported seeing a motionless body inside the parliament building, which he could not confirm to be either dead or alive. Dozens of shots were fired throughout the building. The gunman was subsequently chased by police into its center block. Prime Minister Stephen Harper managed to exit the building safely. Ottawa Hospital received three patients - two of whom had non-life-threatening injuries, according to a hospital statement seen by Reuters. Canadian Armed Forces bases across the country are in lockdown and all Ottawa Police stations are currently closed to the public as gunmen remain at large. One shooter has been confirmed dead, according to senior CBC news reporter Aaron Saltzman. Canadian police are investigating Michael Zehaf-Bibeau as possible suspect in Ottawa shooting, Reuters reports citing a source familiar with matter. Ottawa police said they believe that two or three gunmen might have been involved in the incident. Associated Press Television News journalist Jorge Barrera reported that police are in possession of a photograph of one of the gunmen, who reportedly has dark skin and long black hair. Barrera also tweeted that police have the suspect’s cellphone. All three locations are within a few hundred meters of one another. Shots fired at War Memorial at 9:52am today; one person injured. More details to come when avaialble #ottnews. The incident comes a day after another soldier from Canada died in a road accident suspected to have been caused by an Islamic militant. He was one of two soldiers involved in the incident which was the first of its kind in Canada since it joined the fight against the Islamic State. 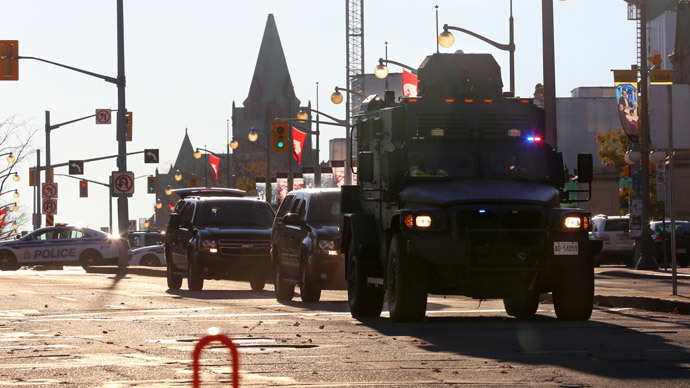 On Tuesday Canada raised its domestic terror threat from low to medium.